After a lot of thought and a lot of courage I decided to make my first YouTube video. I’m starting very slow with a no talking video. But I will make videos with a voice over too, just later. I think I’m not ready for that now. 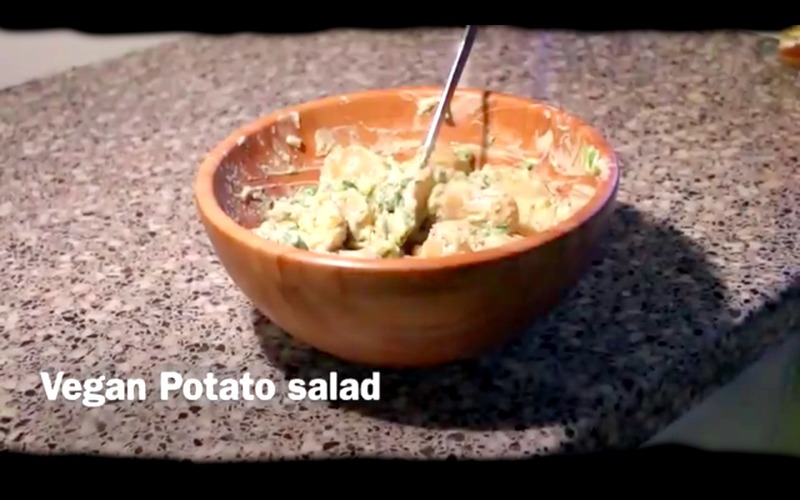 In Iceland it’s very common in the summertime to eat potato salad with almost anything you would cook on a bbq grill. Most of the time I’m bbq-ing veggie sausages, corn on the cob and veggie kebab. But every potato salad made here is made with mayonnaise, so it’s not vegan. I have been thinking about this for about year now what I could use to substitute the mayo, and finally I found something that I liked. Plain soy yogurt. 1 small pot of plain soy yogurt. Sorry to be negative, but the music doesn’t really suit the video Thank you for sharing the recipe though! Do they not have vegan mayo in Iceland? In the US, it wouldn’t be too surprising to find vegan mayo at a normal grocery store.